If you’re a new pet fish owner, you may be a little bit confused as to which filters are the best for your fish and which ones you should avoid. You may even be wondering if having a filter is even necessary for your tank. Making sure that your goldfish tank is sparkling is one of the best ways you can ensure they have a healthy life. Keeping the water they live in clean is an easy alternative to paying later on with vet visits and expensive medicine to help them feel better. Does a Goldfish Tank Need a Filter? How to Choose a Filter for Your Goldfish Tank? Is it important to get a filter for your tank? Yes, because changing the water once in a while can only do so much, but having a filter that’s constantly turning over the water does so much more. Filters are an affordable and easy way to keep the water moving and prevent any bacteria buildup in the tank. Aside from keeping the water from becoming stagnant, a fish tank filter also takes out any waste and leftover food from the tank. If these things were allowed to just sit in the water, they would quickly become a buffet table for harmful bacteria. Not only that, but this kind of waste increases the ammonia levels in the water. These rising levels of harmful ammonia can cause a whole host of problems for your fish, like skin burns, swim bladder problems, and general sickness. Finding a good filter can be difficult, but it’s an effort you must make to help your fish live a happy and healthy life. To find a good filter, you need to understand what your fish requires to live a healthy life. You want a filter built to meet their needs, whether that’s with wave creation or a fast turnover rate. Check out these filters to get an idea of what to look for. First up is the impressive Aqua Clear Power filter. This filter is a small, but efficient product ready to be used almost directly out of the box. It’s ideal for use in fish tanks that hold 5-110 gallons of water. Despite its small size, this filter has about seven times the capacity and volume of comparable filters. This filter also comes fully loaded with many different layers of filtering agents inside to give your tank thorough filtering every time. The only problem with this filter is that the level of maintenance required is more than other filters. Because of the different layers of filtering agents, you would need to change out all of those filters once every two to three months. That can become time-consuming if you’re looking for a set-it-and-forget-it type of filter. Next up is the MarineLand Magnum water filter. The MarineLand filter has a good maximum rate of 290 GPH and a three-stage filtration system. This filter is also ready to be installed right away because no priming is necessary. 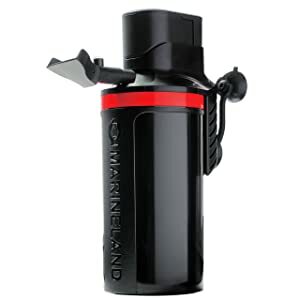 Another good feature of the MarineLand filter is the fact that it already comes with a Black Diamond activated carbon cartridge for filtration. There’s also a dual-chamber media container that you can use customized filtering agents in. One negative point that’s worth mentioning for the MarineLand Magnum filter is that making the switch from a three-stage filtration system to a water-polishing system can be difficult. Both of these features are included in the filter, but switching from one type to the other can get confusing. While instructions are included on how to do this, no one wants to have a confusing filter. Third on the list is the Marina Power filter. This filter is the most cost-efficient one on this list. It’s got a slightly below-average rate of just 20 gallons, comes with a multi-step filtration process, and has four filtering cartridges. 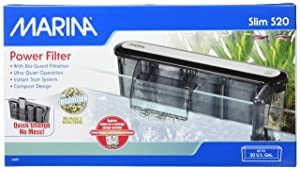 A good feature that the Marina Power filter has is a customizable water flow option, making it perfect for turning the flow higher or lower depending on your fish’s needs. This makes a good starter filter because it’s easy to install and has customization options until you know what works best for your fish. One thing going against the Marina Power filter is that it has a pretty low maximum gallon capacity. Although it’s alright for the price and size, it’s still a bit on the lower side as far as this list goes. If you have a bigger tank than 20 gallons, you definitely want to pick something else. Next is the MarineLand Penguin Power filter. This filter comes in many different sizes, starting at 20 gallons and going all the way up to 70 gallons. Depending on the size you get, you can have a filtering rate of up to 350 GPH. The different sizes are a good feature to have because it means that one model or another is bound to be a good fit for your tank. The MarineLand Penguin Power filter is also built to perform a three-step filtration process for your fish tank. The only downside for this filter is the fact that it’s not as quiet as other filters. When you first install the filter, it takes some time for it to adjust and get a good water flow going, causing it to be a little loud. Similarly, when it’s close to the end of its life, the filter also makes loud sounds due to extensive use. Nearing the end of this list is the Fluval C Power filter. This filter is different from the rest because it has not three, but five, different stages of filtration in its cleaning process. 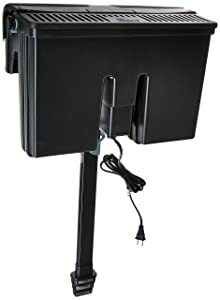 It’s great for aquariums of up to 70 gallons (C4 Tyle), making it capable of handling large sized tanks. 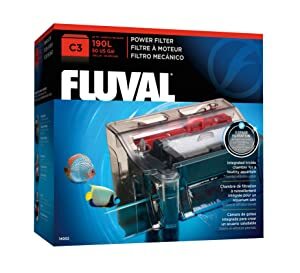 Another unique feature for the Fluval C power filter is that it comes equipped with a cleaning indicator that lets you know when it’s time to rinse out the polyfoam cartridge. One problem you might face when using the Fluval C power filter is that it also tends to be a bit louder than most filters. You can definitely get by if you don’t mind extra noise, but the loud sounds definitely make it stand out. Last, but not least, is the MarineLand Emperor filter. 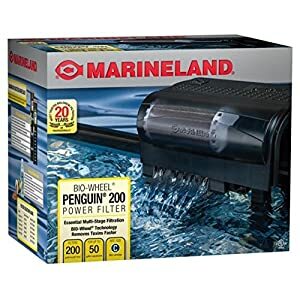 Another great option by MarineLand, this filter packs a punch with an amazing flow rate of 400 GPH, and is also one of the largest ones on the list, with twice the filter cartridge capacity as most other filters. It also has an extra-large BIO wheel filtration system, meaning you can trust that the water in your tank is thoroughly cleaned and treated with each use. A common problem that users face with this filter is that it’s also a little loud. Usually, this isn’t a problem with these types of filters, so it’s pretty unusual to see this in this one. If you don’t mind having a little extra background noise though, this is still a great option. Now that you have a bit of an understanding of different types of tank filters, you can turn your attention to finding one that fits your specific needs. There are a few different things you need to keep in mind when shopping for the right filter. The size of your goldfish tank is one of the first things you should note before buying a filter. A goldfish tank is measured by the amount of gallons of water that it can hold at a time. This amount is important when buying a filter because if the filter doesn’t have an accommodating maximum flow rate, your tank won’t get cleaned properly, and you run the risk of getting your fish sick. Figuring out how many gallons of water your tank holds is the first step in buying the appropriate filter. Check your aquarium gallon here. The next thing to pay attention to is the water flow rate in your tank. This is related to the size of your tank, so if you have a fish tank with 30 gallons of water in it, you want to get a filter that can turn over about five times that amount, or 150 gallons, in an hour. A good water flow rate ensures that your tank is getting cleaned at a pace that’s not too fast or slow. There are many different types of aquarium filters you can try, like sponge filters, power filters, and canister filters. A sponge filter is normally used in breeding tanks and is powered by an air pump that forces the water through a sponge-like material. This allows beneficial bacteria to also take root and promote water health. A power filter utilizes electricity to pull the water through the different types of filtration cartridges. These types of filters are also known as HOB or hang on back filters because they usually hang on the edge of your aquarium. Lastly, there’s the canister filter. 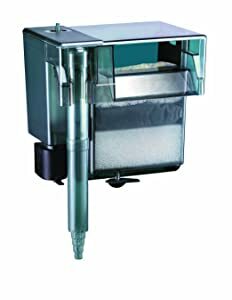 Canister filters use electricity and utilize a ‘water bar’ to spread the outflow of clean water along the bar. This type of filtration is good for saltwater and planted aquariums. There are three main types of filtration that occur in a healthy aquarium. Mechanical filtration is when the water is forced into a filter that’s designed to catch any waste particles during the transfer. Chemical filtration refers to when toxic chemicals pass through a filter. This filter has been specifically designed to attract those kinds of molecules and remove them from the water. Finally, biological filtration occurs when different bacteria are dissolved with the help of good bacteria. A biological filter promotes the growth of good bacteria and stops the appearance of harmful types. All three of these methods of filtration are necessary for a healthy aquarium, so getting a filter that has equipment for all three is the best option. After all of this information, you may feel overwhelmed at the thought of buying a filter for your tank. The good news is that you can enlist the help of the experts at your local aquarium store to figure out any details you may be confused about. Once you find your perfect filter, you can continuously use the same brand and model, and your fish can continue to lead happy lives because of it.